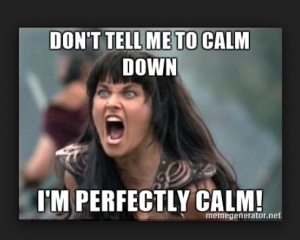 Calm Down About Calming Down! 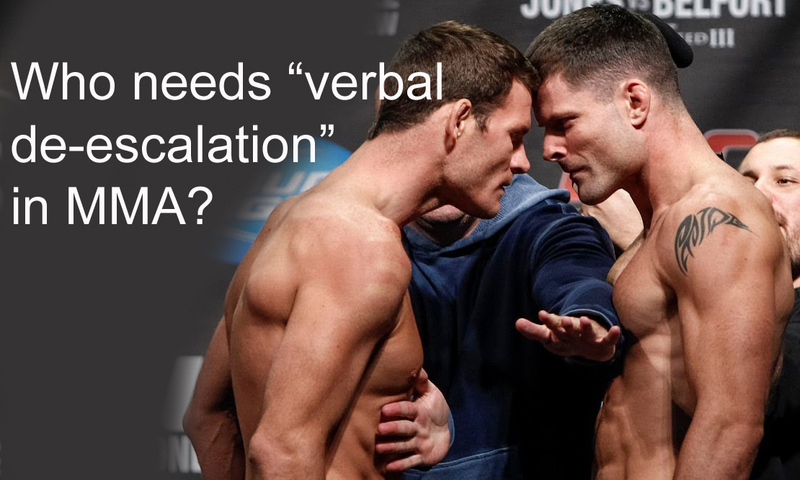 I wonder…has the de-escalation fad sort of died down? It seems like it was all the rage a while back. Everyone was preaching it in seminars like they were doctors of psychology (you just need to be a doorman, right?). 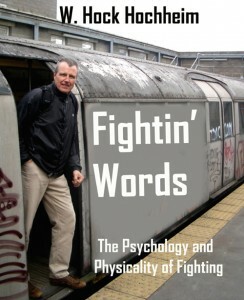 That subject, and the secret tip-offs subject of “Pre-Fight Indicators,” – as some now call it now, were all the fads. Maybe not? I do realize with the rabid, total invasion of BBJ and MMA, perhaps a whole lot of training these days is just about sport fighting, sport wrestling and exercise/fitness and not much about talking and survival. Some Kravs cover this topic. But, there’s not much on de-escalation in the sporty world, is there? Why should there be? Yet, despite the gap, the fad seems fading? Me, not being in any of those officially, I’ve covered that stuff for decades as part and parcel of my courses. Stop 1 of my Stop 6 course covers this, though one must continue to communicate throughout the Stop 6, throughout the whole fight if needed. Decades? Is this advice decades old? In policing this stuff is, as they say, “old hat.” The first list of fight pre-cursors …er …I mean…”indicators…I saw was in the military police academy in 1973. (How’s that for new?) And the list hasn’t really changed much. 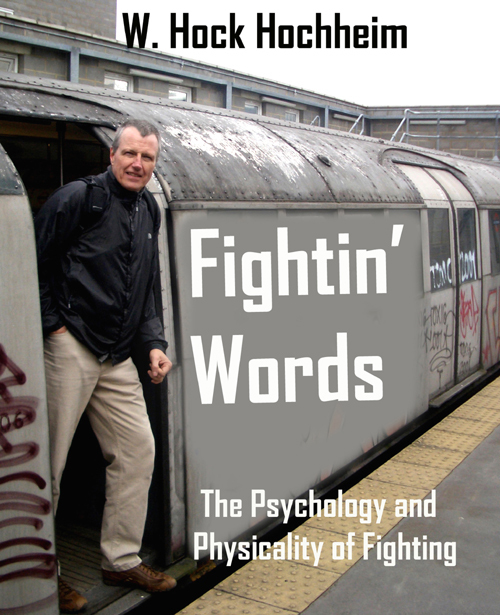 My collection/list is in a chapter in my Fightin’ Words book for all “rookies” to see and vets to review. And in police work, we have been, and are, all… about… de-escalation. I attended my first police, “Verbal Judo” class in the 1981. It has always been vitally important in police work to have a “way with words.” I like to say that if I were involved in hiring new police officers, I would seriously examine how “charming” they can be. How witty. How improvisational. How…calm. Charm and calm can go along way in the world, in policing, in arguments.Then sometimes…not. The gambling outcomes, should not cripple you. So, I myself yawn when I hear people clamor about this-or-that, Joe Blow’s seminar on de-escalation and…”oh, oh my GOD! “And…did you should hear the fight precursor tips!!!! Joe Blow is like Moses!” Folks, those tablets came down from the mountaintop decades and decades ago. So then, have you heard the one about…calming down? Speaking of regurgitation from the masters… I heard yet again about an attendee of such training. He said, that they said – the instructors that is – that one thing you should NEVER say to de-escalate a situation, NEVER, EVER, NEVER, is to say “calm down.” This ALWAYS makes matters far, far worse, they proclaim. This advice always gets the surprise gasp and laugh from the crowd. But, this is often an inexperienced, regurgitater, trying to sound all…”insider-ish,” veteran and cool. I just don’t believe this is always true. Here’s why. First off, I have been dispatched to a whole lot of domestic disturbances, arguments and fight calls. And also, when damage was done, I had to investigate them. A whole lot in 26 years. I want to tell you that “situations” are different. They are different. And at some points in various situations, using the term, “hey, let’s all calm down here,” and variations thereof, does not ALWAYS create World War Three. It depends so much upon (did I already say situation?) the old “Ws and H.” Most of you know by now, I always analyze the world through the Who, What, Where, When, How and WHY recipe. Who? Who are you dealing with? A guy who wants to fight every Saturday night and it’s getting near midnight? Who are the onlookers – are we in a show of some sort, where people cannot back down? Who are you anyway? Someone with any speech finesse? A bit of a negotiator? What? What is this confrontation about anyway? What are your personality skills to handle it? What are your physical skills to handle things if they go south? Where? Where is this happening? Private? Public? Again, are his or her “friends” around watching and the loudmouth must put on a show of some sort? Why? Why should any party in this mess calm down? Why do you care? If it’s about you? You’re involved? Why are you still there? Keep asking the “Ws and H” questions about this subject and you’ll think of even more. 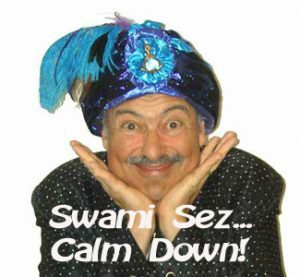 One of the worst ways and types of “calm downers,” is when a verbally, skill-less person, obnoxiously shouts, “CALM DOWN!” Almost like a bully or disliked boss would. If that kind of jerk says just about anything it might never work anyway. And therein lies the real problem. Are the two words “calm down” the real culprit to peace? Is it the messenger too? The message or the messenger? There is a lot more going on here than just two “taboo” words. I think much of our interactions in life are scripted. The script of life. Just about everything does have a script. A script at a fast food window. A script when you enter your office or job. A script at dinner. Your skill at improv, at going “off-script” is important. So, at worst, what are some of the typical, scripted responses to your “Let’s all calm down” proclamation. “Line! ?” The actors whisper on stage when they forget their next line. What’s your next line in this script? Better write one or two ahead of time. But in summary, I just hate to see people and the police completely stripped of this “calm down” term and idea completely. It is not so taboo. This phrase has and will work. I’ve done it. I’ve used it. I know, I know, I know, a couple of you out there will have some “calm-down-failure” stories. Sure. Probably because of the “who, what where, when, how and why,” and not just the phrase itself. And sometimes because some numb-nuts out there just wants to fight you or them and was drumming up an excuse to do so. He might just want your watch? In that case, anything you say will be over-ridden. But the term has and will work in some situations, I just hate to see it completely erased from your options. Okay, now calm down, I’m just telling you the truth about calming down. Previous PostRemy Presas and Ernesto Presas – It’s a Macho Brother ThingNext PostHarvey, Give Me the Shotgun, Or Else!